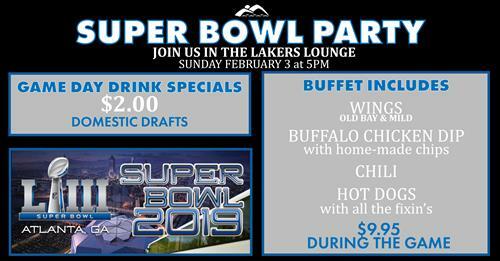 Join us Super Bowl Sunday in the Laker's Lounge at Alpine Lake Resort! We'll have $2.00 domestic drafts and a loaded buffet with wings, buffalo chicken dip, chili and hot dogs with all the fixin's at a discounted price. Even the tailgaters will wish they were there! Join us in the Laker's Lounge at Alpine Lake Resort for a great time watching the Super Bowl! February 3rd starting at 5pm until the game is over! No admission fees, just come on in and grab a seat!